companies and businesses related to golf. So what's a PGA Tour member doing selling toilets? disaster that turned into a huge stroke of luck for Purdy. last minute decided to enter. before was a tie for 15th in something called the Hibernia Southern Open. Kohler didn't know Ted Purdy from Ted Nugent. make the cut in the pro-am for the first time in his life. better yet, call George W. Bush.' He was really upset." Rule No. 1: Always sign your score card. last year and I've got a kid on the way. This is the low point of my career. What am I going to do?' "
"I think Herb felt so bad about what happened he wanted to help me,"
probably no coincidence that his career took off. year and, more importantly, earned exempt status on the PGA Tour. 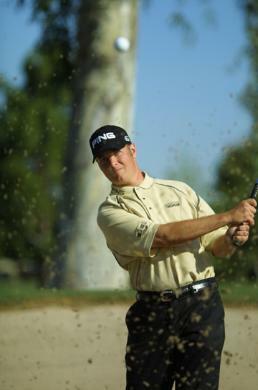 In 2004, he banked $1,636,876 and had runner-up finishes in the B.C. stroke over Sean O'Hair. He already has earned $1,542,555 this year. "The luck of Kohler," he said with a grin. "It's never-ending." In his first British Open last week, Purdy finished in a tie for 74th place. flying directly to RAF Leuchars near St. Andrews. just the ride over trumps about any other sponsorship anybody else has." was all over TV for a few hours and in magazines and things. convince him that I do." In loo of that, let's just say Purdy is worth his weight in porcelain. shortly, it's an easy walk from No. 11 to No. 16.
anything, period," he answers gruffly. dangle from a heavy steel chain. green, bells clanging. 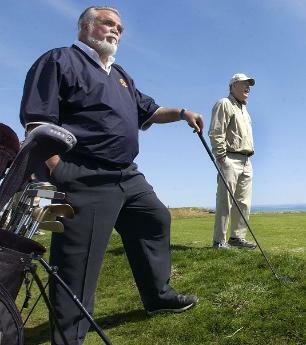 "They're the real owners of the course,"
rough so you can get a clubhead through it." the AT&T, and I'm disqualified," he grumbles. Café Man in the credits, shoots a man in a pivotal scene. whole bunch [of rounds] in the 90s," he says. me a new set of Pings," he says. mashie, just as golfers do on the classic courses of Ireland.